We’ve been up checking on my wife’s mom upstairs since 3:30 am. I have a recurrent ground school for Astra today, and will get through that just fine with the usual 6 hours of sleep. Had to turn down a Westwind flight for this week to get my colonoscopy done (I’m 60), so I’m a little disappointed that I lost some momentum with my Vermont friends. I really want that to work. Life is a flurry of activity, so I’ll stop trying to organize my thoughts any further than I have, and just put it out there. N833DF is coming back! No one knows any more than I do how many times I have said that and been disappointed. I feel like the momentum is there to bring this nightmare to a close now, and get my new airplane in it’s hangar! The hard parts are behind me. Matt had a week off last week down in Florida getting his seaplane rating. That meant my airplane progress also got a week off and I wouldn’t be flying myself for a little longer. Texting with him at the end of the week, I did get the sense that he was still on target to finish up this next week. That would mean that my airplane will be flight-test worthy by next weekend. He reminds me that he is making no promises on next week, but those words are not necessary. I’ve been waiting for two years and delays are like breathing with this project. I feel so confident that the end is near, however, that I decided to visit my hangar for the first time. Subscription updates: After the last visit, I brought my Garmin 496 home to replace the battery. I was convinced it wouldn’t even power up after sitting that long, but was surprised when it not only started, but actually held a charge! Updating the unit from my MAC proved to be a challenge. When that didn’t work, I tried my old windows 7 laptop, and finally Bev’s newer windows 10 laptop. The result was the same, my GPSMAP 496 wasn’t being recognized. There had been a significant number of updates since the firmware version 4.20 I had installed circa 2014. Version 4.80 had new XM antenna drivers in it, but that one actually made me nervous. My antenna is more than 10 years old, I think. I contacted Garmin after all of my attempts failed, and found them to be of no help whatsoever. They were nice, but offered zero guidance. back to YouTube and Google to search for new clues. Somewhere in my travels I found a comment that referenced setting the ‘Transfer IN’ setting before updating firmware. That ticked a path in my brain, and I found it and turned it on. BANG! Firmware went in on the first try; then the terrain; and finally the new navigation data on a one-time basis. Since this is is a supplemental unit, slaved to the Garmin 530 Waas, there is no need to update this one monthly. Updating the GPSMAP 496 every two years should be sufficient. As far as software and subscriptions, still to go is for me to reactivate my Sirius XM weather subscription on the 496 and the navigational data on the GARMIN GNS530 WAAS. I can test fly and get started with neither active, so I’m waiting a little longer. The moment the airplane gets released I’ll get that done. 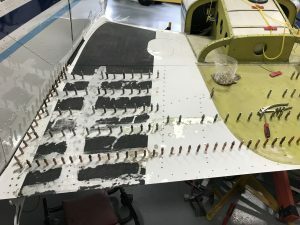 The ELT battery and main battery will both be replaced before the airplane flies. The Aspen battery was never used, but has timed out and will be replaced when the airplane gets a fresh IFR certification. I’ll also update the Aspen and Garmin software at that point, so I’m hoping Red Eagle can fit me in. Remember that my Bendix King KX-155 was overhauled two years ago and never tested. I’ve hoping that works well out of the gate. Time to stop worrying and move forward, addressing whatever get’s in the way. Paint shop: That brand new paint job was crunched during this work. It’s a damn sin, but such is life. Talking with Kendall at the paint shop, he’ll have to see it physically before telling me what he can do. I worry that the bare metal will be exposed for too long in my unheated hangar, but again, I’ll have to take this one step at a time. Flying up to the paint shop also means I’ll be going into what I consider a short field again, after a two year layoff from flying this machine. One step at a time. The seniors are having a hard time: Beverly and I have also been reorganizing our basement, working to get rid of all the extras we’ve gathered over the years. It amazes me that we can get rid of 8 large boxes, and still have many more iterations to go. Health care professionals and visitors are coming and going all the time now that her parents live with us. It will be helpful if we had more room in the basement to store important things, and more room upstairs for the equipment it takes to manage seniors. As I’m loading my car, my wife was upstairs being trained by a nurse to track her father’s blood thickness (INR). Doing this in-house meant not having to take him to the doctor’s office once a week and expose him to winter weather. He has late stage kidney disease as well as serious COPD, and whatever load we can take from him will help. Mom currently is battling a potentially life-threatening upper respiratory infection. Beverly hand feeds her meals, and comforts her while working with remote home hospice nurses to manage medications. In-laws come and go to visit and leave advice before returning to their own lives. I never know who will be at the house at any given moment. Opening the Hangar: I’m moving my airplane stuff from the basement and into the hangar. I man-handled my gasoline power tow up from the basement first. Bringing it around to the garage, I filled it’s one tire with 12# of air. The tire doesn’t look dry rotted, and seemed to hold the air just fine. The engine had aged but clean oil. It hasn’t been run for over two years, so I put gasoline in it and gave it a pull. The little red PowerTow started immediately, and I took that as a good sign. As I let that cool awhile, I loaded up my oil rags, cowl plugs, chocks, and the airplane’s cover into the CRV. Finally, I gently placed the tow into the back of my brand new car and drove over to the airport. I drive gently to keep the inside of my new car from getting marred from the cargo I have aboard. The gas fumes are noticeable as I go, so I open the sunroof and side windows to the 40 degree air. Until today, I’ve avoided any activities that make me think about my airplane. The thought of it languishing on the ground was too frustrating and saddening, so I focused on other things. I’m really thinking I might actually get this project closed here shortly, and am praying it comes to pass. I’m balancing getting ready to fly with protecting myself from a significant disappointment if it turns out not to be ready. Pulling up to the gate, I fumble for my airport ID. Now I wondered if the gate will even work for me, since I’d never used my badge until today. Sunday wasn’t the day to get a card problem addressed, so I could be heading back home and unloading all this stuff. I swiped the gate heard it start beeping – another good sign as the gate slides open. Now my brain focuses on the next step – finding and opening my hangar door. That requires a key, which I now realize is not on the neck strap as I expected. It’s home somewhere safe, and I’ll have to drive home one more time today. So now that I’ve driven 20 minutes over here, I will not be able to get into my hangar after all. Rather than be upset, I took in the view and pictured myself at this very spot two weeks from now. With no one between my airplane and I, I’ll get to spend the day inspecting and organizing it’s full recovery to usefulness. My airplane will be in it’s hangar – where it belongs. I drove back home and found my key in my brief case. I took the time to find a ring and put it on my neck strap so that this won’t happen again, and stick my head in to let Beverly know what I’m doing. She is very busy with visitors, as well as the nurse and her medical training. I left without telling her I was an idiot and didn’t get my simple objective completed yet. 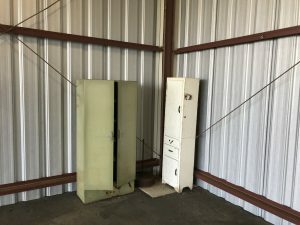 Back at the hangar, I opened the door and found some old cabinets and a rug had been left behind. There was also an old desk which I’ll find a use for in the hangar, so they could leave that. I figured out how to open the electric door and I’m going to like this setup. It is nowhere near as threatening as the medieval marvel of engineering in my old Delaware Airpark hangar. This one wasn’t always trying to kill me. I did see quite a gap in the door when closed, ho wever, so I might as well ask them to adjust that before I move in. 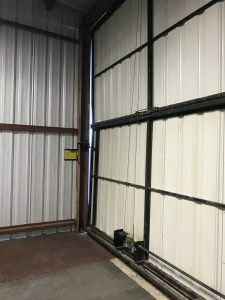 My hangar has nothing in front of to the sides blocking the wind, so I can visualize snow and rain blowing into the gap during storms. For $500 a month – they can address that. I sent these pictures to my friend at DRBA to see if I could have them addressed. I can remedy these things on my own if not, but I’d rather the hangar be move-in ready when I come north. 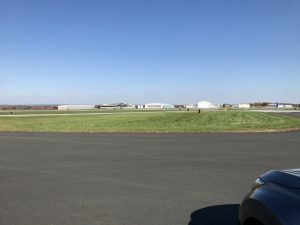 Before leaving, I drove the taxiways to understand what I’d need to do to get to my hangar from the runway. Things have changed since I’d last flown out of this area, but now I’m comfortable.